A couple weeks ago, the boys and I were driving in and around Brunswick, Maine trying to find someplace to stop for breakfast. We passed a church sign that asked “Does God have a big toe?” and both boys started laughing uncontrollably. I asked Henry what the sign was asking. 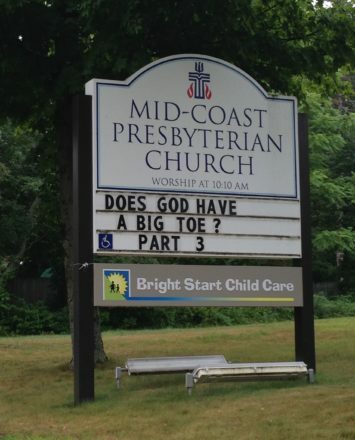 “It’s asking if God has a big toe.” I pressed Henry on what the sign was asking and after two or three back-and-forths, he figured out that I wasn’t asking him to tell me what the sign said but instead trying to get him to figure out what it meant. Now, we both missed parts one and two of this sermon and weren’t going to be stopping in on part three, but I shared my best guess with Henry, that the minister giving this sermon was trying to talk about God as both divine and human. The religion behind the question was really irrelevant here, but we were in agreement that the thought-provoking question had more “curb appeal” than any idea shared as a statement of fact. We decided to drive to Portland to get donuts and continued to talk about questions and started talking about school while Will napped. I asked Henry if he remembered the inquiry-based units at his old school. As an IB school, Units of Inquiry were a staple of the Primary Years Program, the IB program for the youngest learners. Henry loved any time he worked with these inquiry units, and he said that it was because they were learning about important concepts while trying to answer a question, doing authentic research without textbooks and working together to [my words] create understanding. Then, as different groups would share their research, it would push the whole group’s understanding and continuing research further, culminating in a presentation of the knowledge the class had developed. I loved teaching in the IB’s programs because, eventually, everything I taught was rooted in inquiry, even in the high school grades. My students and I learned together through questions, answers, solutions, and more questions. And while I’m no longer at an IB school, the IB had a profound impact on the way I teach. I still do some work for the IB as a consultant and workshop leader and it is so energizing to watch a teacher – and even better a whole school district – get how shifting towards an inquiry-based model can have a profound impact on their students’ learning. And we’ve all been told that Kindergarten is the high-water point of education, as kids start school knowing that the way to learn anything is to ask questions. Slowly, as years pass and grades progress, we teach the questions out of them unless whatever we’re talking about is going to be on the test. We should be doing better than that, and I’d argue that even a school that already values the importance of student inquiry could do an even better job at it. We ask questions because that’s how we learn, and it always hurts my head a bit when I see a classroom experience unfold without a good provocation, a chance for further questions, or a chance to detour from what was “supposed” to be covered. So here we are at the start of a new school year, and I wonder how well I’ll do in the third year of the exciting adventure I’m on in helping a faculty let their students ask more questions and find their own answers. This entry was posted in Uncategorized and tagged inquiry, learning, question, teaching on August 28, 2017 by basil. This entry was posted in Uncategorized on March 3, 2017 by basil. This entry was posted in Uncategorized on February 4, 2017 by basil. This entry was posted in Uncategorized on January 11, 2017 by basil. This entry was posted in Uncategorized on September 6, 2016 by basil. #Repost @racitl with @repostapp.・・・Always excited to see what our third graders are working on during their Genius Hour. It's my favorite time of the week. This entry was posted in Uncategorized on January 20, 2016 by basil. This entry was posted in Uncategorized on October 28, 2015 by basil. I don't remember getting this letter at the time, but my mother just unearthed a classic. This entry was posted in Uncategorized on May 9, 2015 by basil. This entry was posted in Uncategorized on April 18, 2015 by basil.